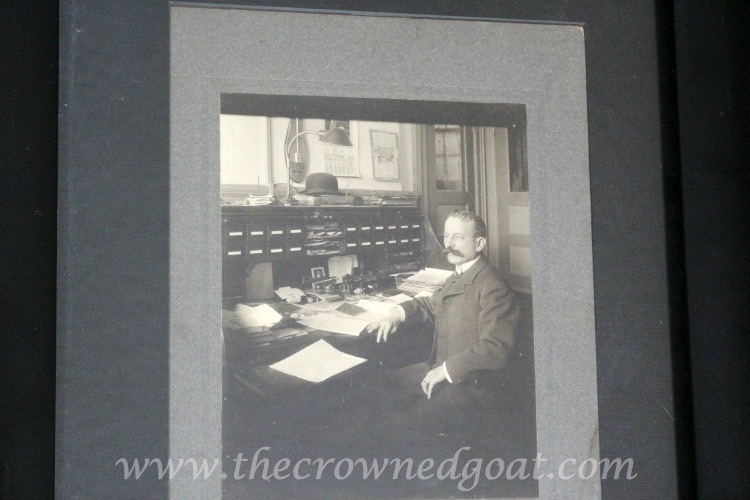 A few weeks ago, I received a note from Lisa of Concord Cottage. It read, “Congratulations Coco, you won the shower head.” I was stunned. The only other time I’ve ever won anything in my entire life was on a family cruise when we all won family bingo. 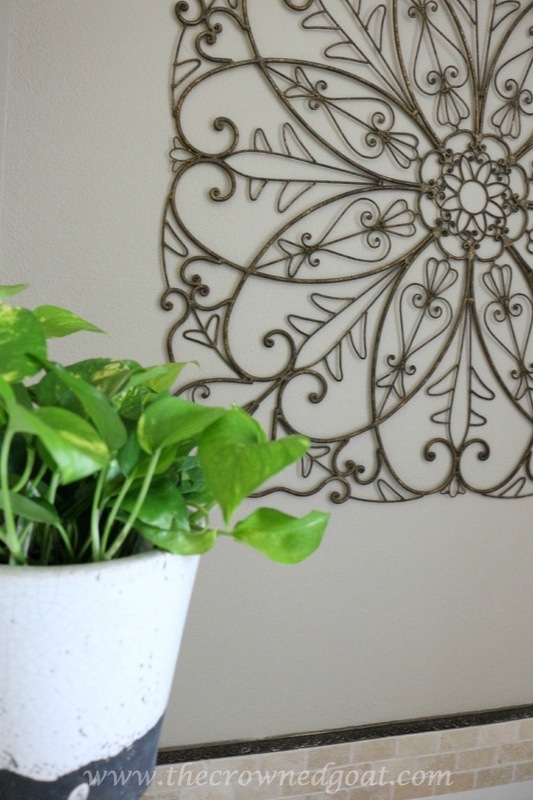 I’ve been thinking about giving all of the rooms in the house a refresh especially since I finished reading the book Love the Home You Have (www.theinspiredroom.net) by author and blogger Melissa Michaels a few months ago. A lot of the book really stayed with me but there was one part in particular that I couldn’t get off my mind. Reading those words totally got me in the gut. I spend so much time painting, hauling, cleaning, tagging inventory, writing and creating that I neglect some of my favorite spaces in the house. 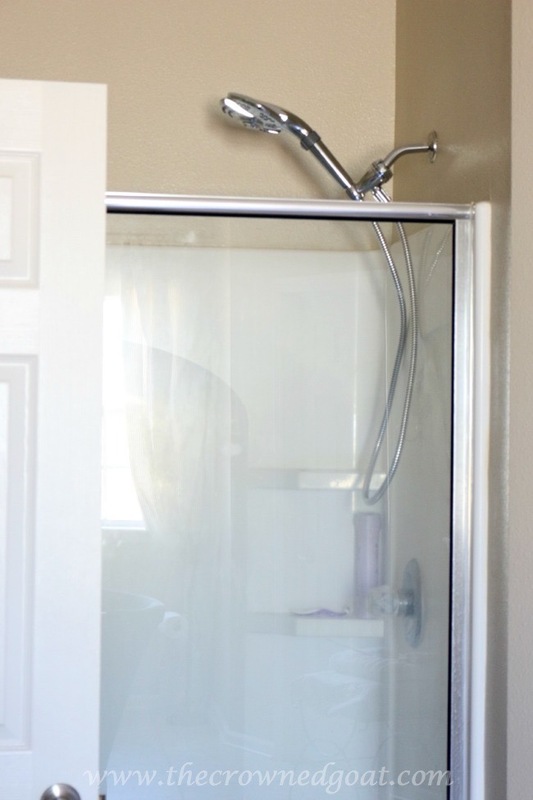 Over and over again I would hear myself say, “I can’t wait to get to the cabin so I can take a break and just rest.” This may sound weird but as soon as I found out I won the shower head, I knew I had run out of excuses. 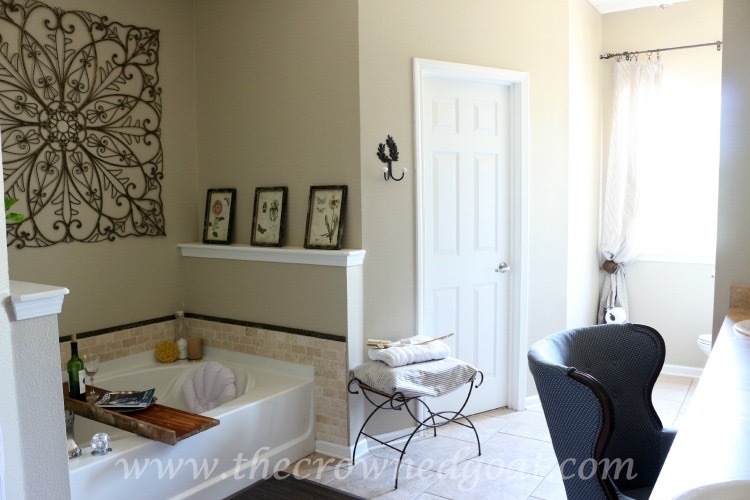 It was just the kind of motivation I needed to give the master bathroom a spa like makeover. My dad hung the curtain rod and ticking curtains last week while he was here visiting. I found a box of these old lobster floats a few months ago and I sell them in my booth. 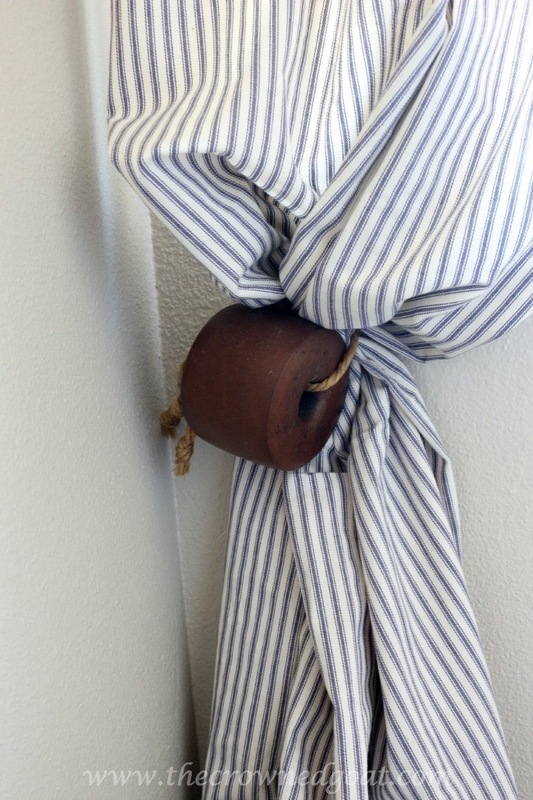 We love the water so I couldn’t think of a more fitting curtain tie. I also hung this picture in the alcove of the water closet. It was really hard to get a good shot of it because of the glare from the window so this is what it looked like in a previous post. The pillow is covered in the same blue and white ticking as the curtain. 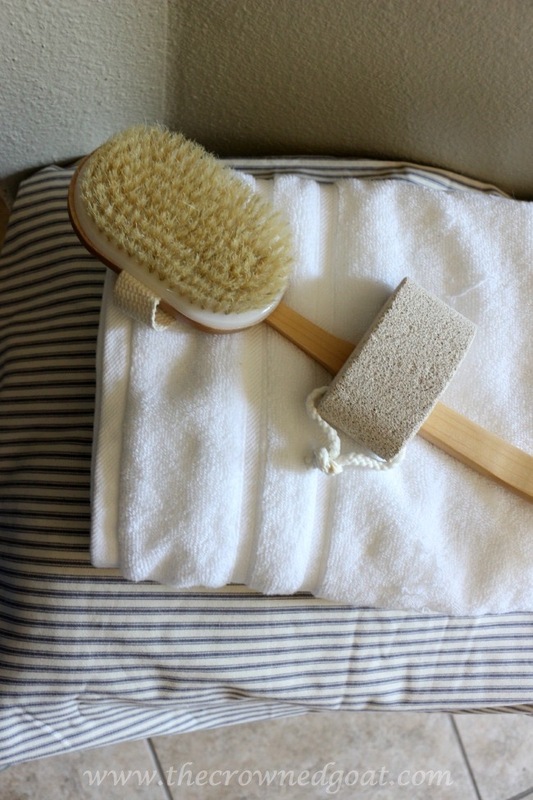 Of course, no bathroom can have a retreat like experience without a few essentials. 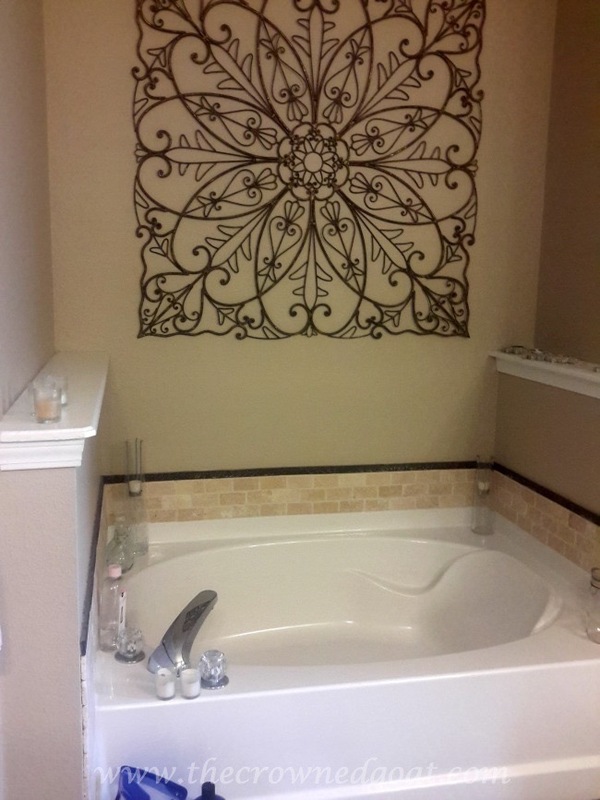 My bestie S put up the tumbled stone tile and trim around the bathtub. It’s one of my favorite features of the space. The bathroom is painted in Valspar’s Lamb’s Ear. The carpenter that built the mantle, door trims and windowsills also built these two ledges. 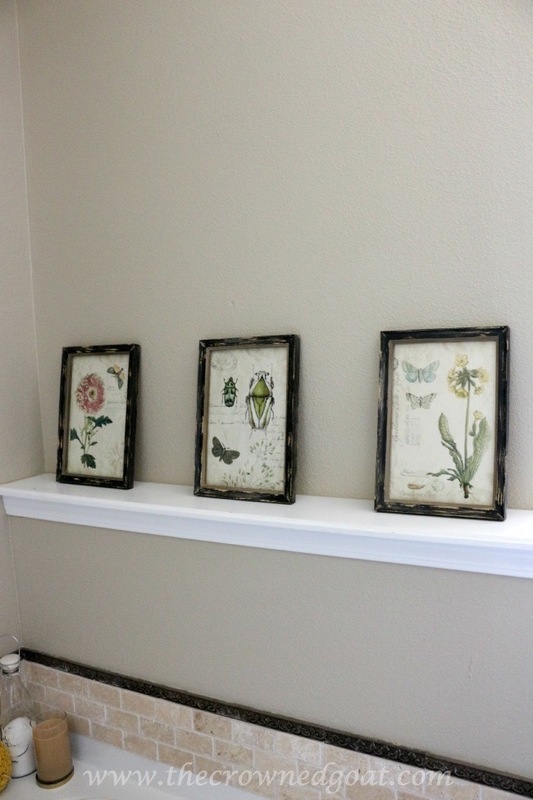 These insect prints used to be in another bathroom but that one got a makeover too. I’ll show you that one next week. We bought these prints on vacation in Georgia one year. The other ledge holds a plant because I am finally starting to appreciate mixing a little green into each space. S found this awesome piece of cedar on the side of the road one day. We cleaned it up and applied Howard’s Feed and Wax and it’s as good as new now. It was a big piece of wood so my dad cut it down to the size we needed with his table saw. I’m on the lookout for a short fluffy bathrobe to go with this sweet vintage picnic basket filled with fluffy towels. It also has blue and white ticking lining the inside. This is a great example of looking at existing items to repurpose them in a completely different way. I originally thought I was going to use the picnic basket in the kitchen. Thanks mom for giving me the idea to use the basket to hold towels. While my dad was hanging curtain rods and pictures around the house last week, he also changed out the showerhead. It is SO awesome! Thank you Lisa and Waterpik! I feel totally swanky now. 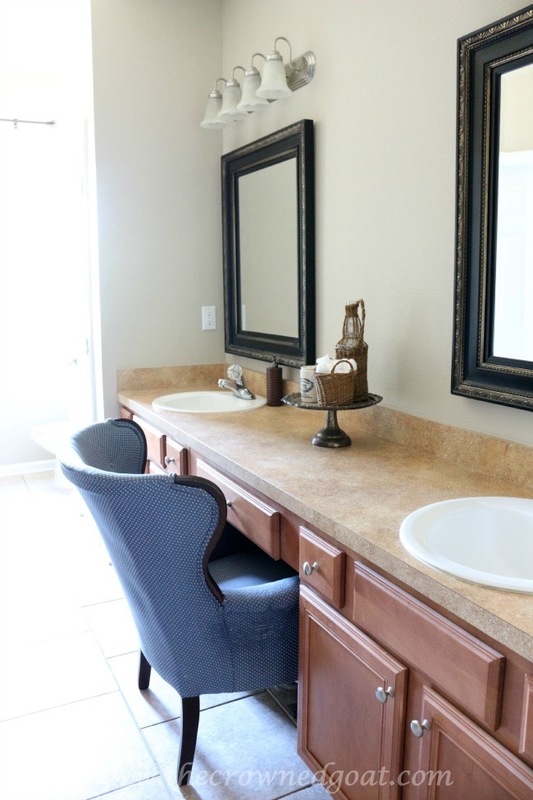 The bathroom counters stay mostly clear except for a blow dryer or the occasional aspirin bottle. I don’t want the counters to be cluttered but I do want them to have a little something on there. 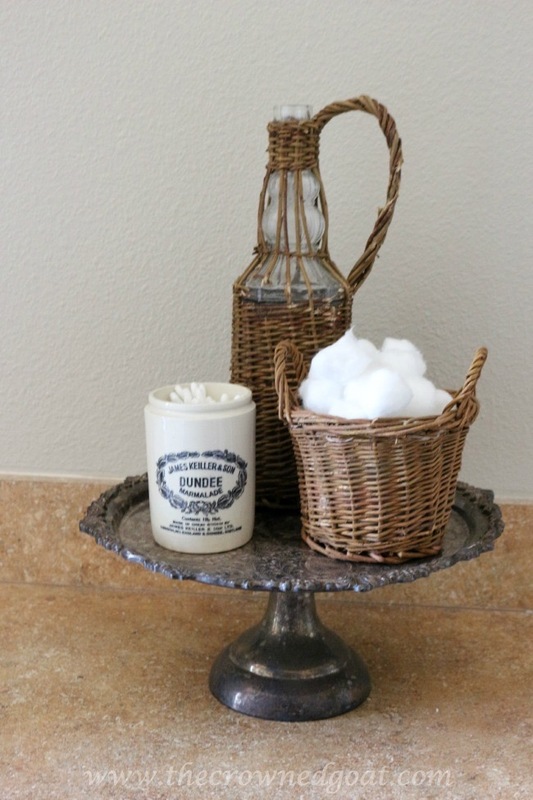 We finally settled on a silver cake stand and containers to hold every day items like cotton balls and q-tips. See you guys back here tomorrow. 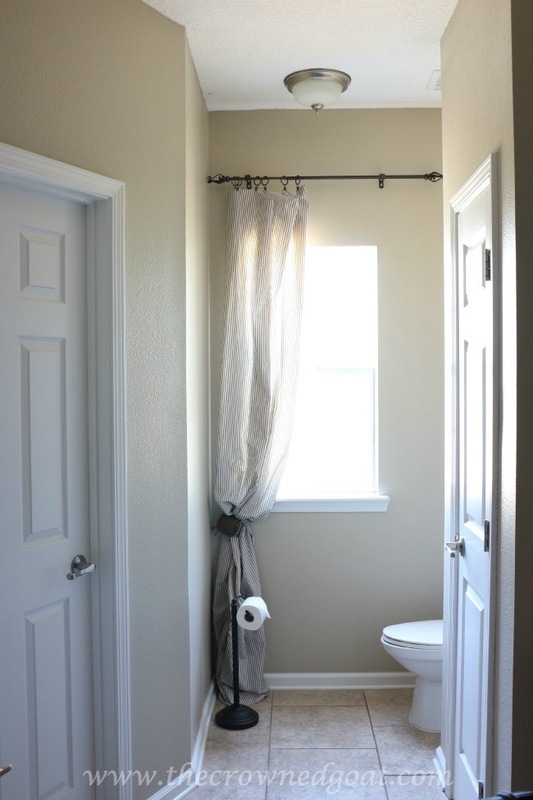 We were so excited about the progress in the bathroom my mom and I decided to give the bedroom a makeover too. 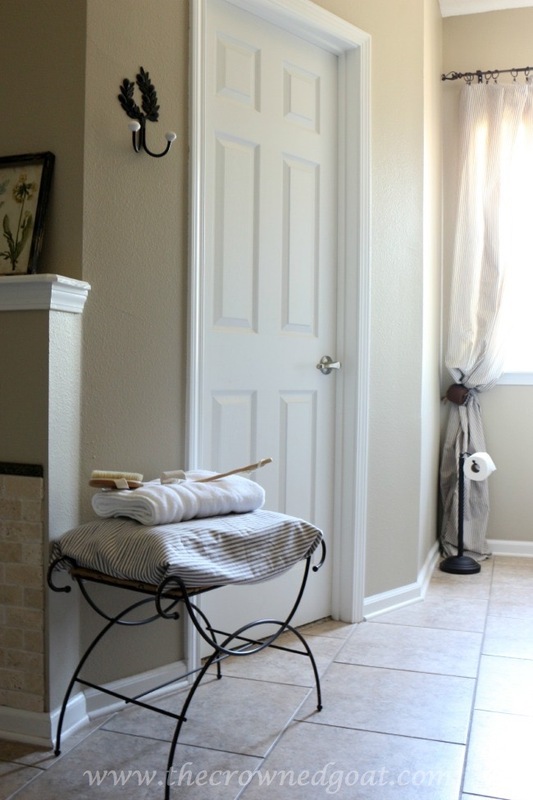 Wow CoCo – this bathroom makeover is fantastic! 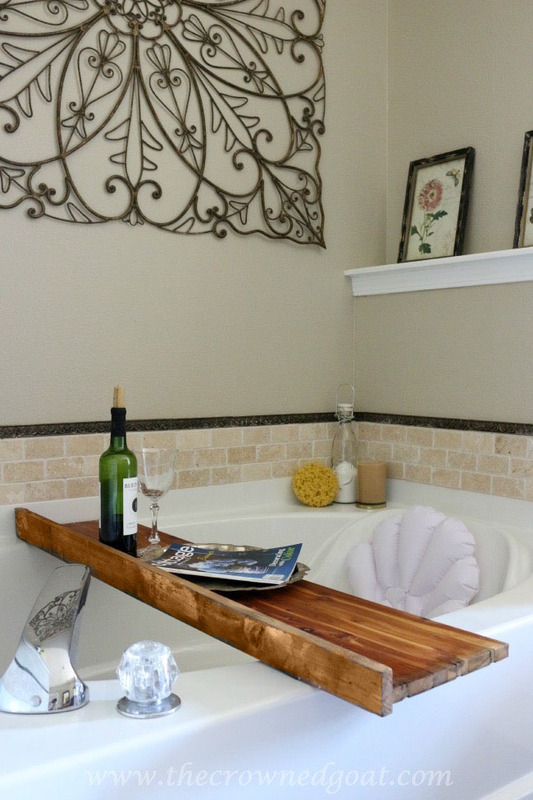 I can’t believe that “S” found that cedar piece on the side of the road…and that you created the perfect tub table with it. ..genius! 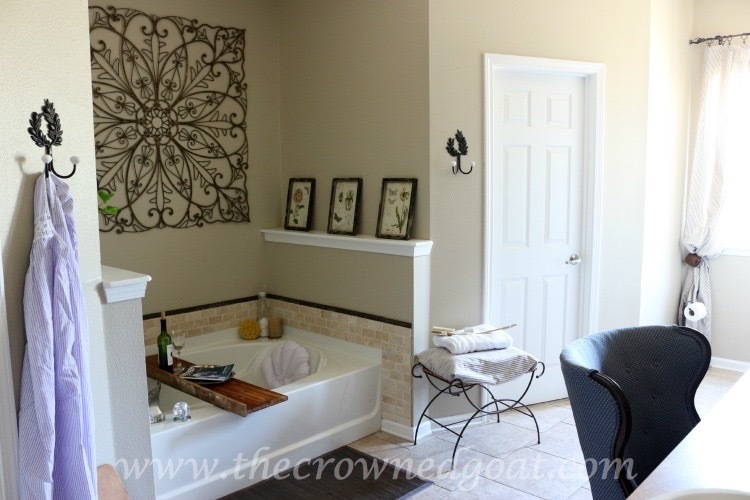 I really like the towels in the picnic basket and your vanity pedestal with the creative holders. All of your hard work has paid off! What a nice, relaxing looking space! That definitely looks like a great getaway from the busyness of life 🙂 Great job!! Great makeover. 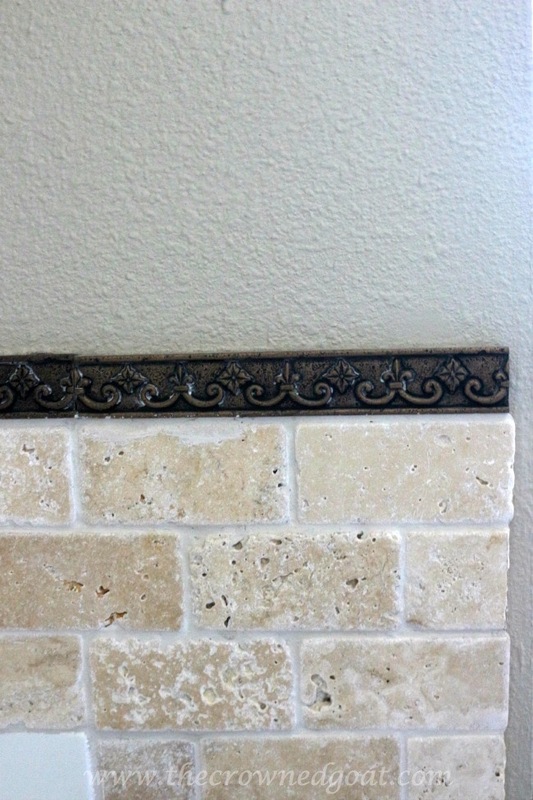 Love the tile and the color scheme, too. Thanks for sharing with us at Funtastic Friday. Please join us again this week. 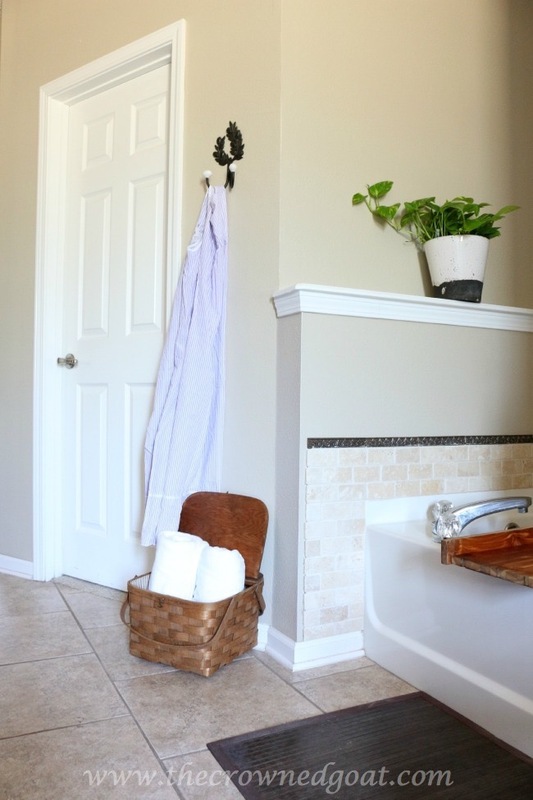 Your bathroom is such a dream! I really love the lobster floats and that curtain. So beautiful! Thank you so much for stopping by and sharing at Dream. Create. Inspire. Link! I can’t wait to see what you’ve been up to this week!